In bowl take maida flour (2cups), cooking soda (pinch), ghee (1cup) mix this well to get smooth dough. If required add ghee and prepare dough. Keep this a side for 2hr. Now take small amount of dough and prepare balls. Press them at top and bottom to get badusha appearance. Heat ghee (200ml); deep fry the prepared badusha. Now take a pan add sugar (1 or 1.5 cups) and water (1/2cup) boil it to get syrup add cardamom powder (1/4sp). Place all the deep fried badusha in the sugar syrup and soak for about 30min. 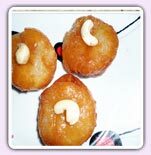 Transfer the badusha in to a serving plate and serve.